Home of the "Silverlight" Kerry Bogs! 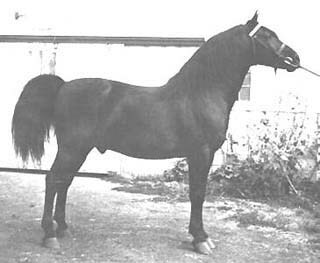 Figure was the one little stallion that founded the Morgan breed today. You can't call a horse a Morgan unless they're bloodlines all trace back to Figure! 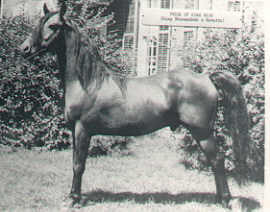 Firmly stated that he was foaled in West Springfield, Massachusetts on January 2, 1789, his exact parentage is unknown, but was rumored to be sired by the powerful Thoroughbred stallion True Briton and out of an Anglo-Arabian mare by Diamond, and as claimed by Justin Morgan himself, she was "of Wild-air breeding, of middling size, heavy chest, of a light bay color, with a bushy mane and tail, hair on her legs rather long, and a smooth handsome traveler." 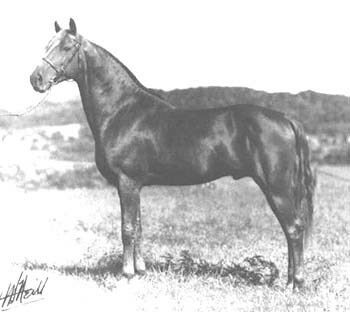 His dam was bred and raised by Justin Morgan, whom was a composer, teacher, businessman, and horseman; her sire, Diamond, was one of the stallions that Justin leased as a renowned stallioneer in Massachusetts and stood to public along with True Briton. The mare that he bred stayed behind in Springfield while Justin moved on to Randolph Vermont. Figure, along with two other colts, was given to Justin Morgan as a payment to a debt, and went home with him to Randolph. Under Justin’s ownership and being leased to farmers as a plow-horse and used for racing, as the colt matured news of Figure spread all over about his strength, stamina, and beauty; he could out pull, out walk, out trot, and outrun any horse in his area. His well-known name was always "Justin Morgan's horse", and after Justin passed away, Figure became known as "Justin Morgan" in honor of the schoolteacher. 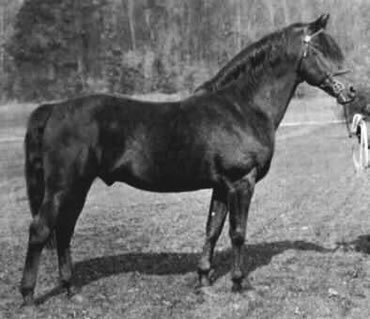 He was also most famous for his unique ability to pass his characteristics on to his foals no matter what type of mare he was bred to. And Figure's dominant genes are so strong that they still determine a part of the Morgan appearance today. And 200 years later, they still remain strong, beautiful, intelligent, and highly versatile. 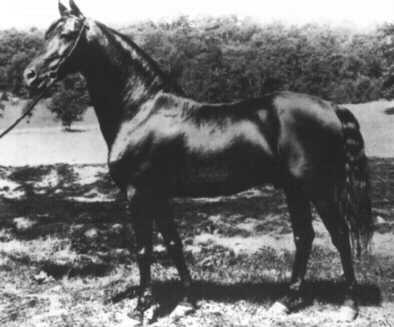 The Morgan breed was one of the first native horses in America. And while the first native breed has died out, the Morgan remains, and is still the "Pride and Product of America". Once only in US, the Morgan horse has now spread to countries all over the globe. Listed below are the four widely recognized families in the Morgan breed. (A family is a group of horses from the same breeding program that have ancestors in common.) The largest families are the Brunk, Government, Lippitt, and Western Working. There is also a smaller "Sub-Family" known as the Lambert, which is a family that has descended from one horse and/or a particular breeding program. The main Foundation sires were bred by Robert Lippitt Knight, who concentrated the breed to it's purest, in which the Morgans included Ethan Allen 2nd blood. Lippitts have no 20th century outcrosses to other breeds, resulting in a pure family line that carries the highest percentage of Justin Morgan's blood. As a result to this careful practice of breeding, Lippitt Morgans continue on the strength, hardiness, and beauty that Figure had been passing on from generation to generation. ** This particular family is actually considered the most ideal expectation of the Morgan, and because of that, it's dwindling numbers actually make it a priority for preservation, going so far as to even be recognized as "Critically Endangered" by the Equine Survival Trust. Also, another common stallion to see in the Brunk family is the stallion Flyhawk (pictured above). Flyhawk himself descends from the Brunk breeding through his dam and his line was used commonly in preserving this family bloodline. The stallion Jubilee King (pictured above right), whom is also apart of the Lambert family, has also contributed his blood to the later lines of the Brunk family. Back in the early 1900's, Morgans were a must as Calvary horses! Given up to the US Government by Colonel Joseph Battell after years of preserving the strongest of the Morgan blood, they began breeding the Morgans for Calvary use and for the public between the years of 1905 to 1951, where the Government Morgan family was started. "The US Government dispersed the herd in 1950, with the University of Vermont purchasing many of the breeding stock to carry on the Government program." The foundation sires of this family were Troubadour of Willowmoor (pictured above left) and General Gates (pictured above right). Mostly all of the Government Morgans trace back to these stallions. Today, the Government family is the largest of the Morgan families. ** Governments have nice swift hindquarters and strong legs, which gave them their ability to be a Calvary horse. Their endless stamina and their muscle make them excellent for long, hard work and their flash and power is what catches the eyes of a judge in the show ring (not many realize it, but if you examine the majority of today's top show sires, they are basically a part of the Government Morgan family). Sometimes referred as 2WFs,"these horses do not have one breeder or ancestor in common, but have a common purpose: to work the western ranges of the United States. Working Western Morgans drew from the Government stallions shipped out west to improve the quality of offspring from local mares, as well as Morgans from breeding programs in Kansas, California, Nevada, and Texas." 2WF Morgans are known for their good feet and legs, deep bodies, strong hindquarters, fast and covering gaits, stamina, and an intelligent, sensible, willing temperament with lots of heart and cow savvy. Sometimes a 2WF Morgan can be mistaken for a Quarter Horse because some do take on a "stocky" appearance. Some of the stallions that played vital parts in creating the Working Western Morgan family are The Admiral (pictured above left), The Headlight Morgan and the bay stallion sired by General Gates, Red Oak. Other stallions that also contributed from other ranches were Plains King, Pride of King (pictured above right), Highview King, Romanesque, Linsley, and Senator Graham. Daniel Lambert (pictured above left) was a great-great grandson of Justin Morgan and was said to be the most beautiful horse of his time. The Lambert line is known for their wonderful dispositions, beautiful movement, and a kind eye with a sturdy conformation. Not to mention beautiful Flaxen manes and tails, gorgeous heads on their shoulders, and a bit of flair to boot. The greatest place to obtain a clean and closely line bred Lambert Morgan is through the famous farm, The Quietude Stud. Lamberts are derived from three of Justin Morgan's renowned sons: Woodbury, Sherman, and Bulrush. But most people connect Lamberts to the core stallion that helped preserve the lines: Daniel Lambert. The single sire that contributes to today's line is Jubilee King (pictured in the Brunk section), who possessed five crosses to Daniel. From Jubilee King came his son Jubilee's Courage who sired the colts Criterion and Cavendish. 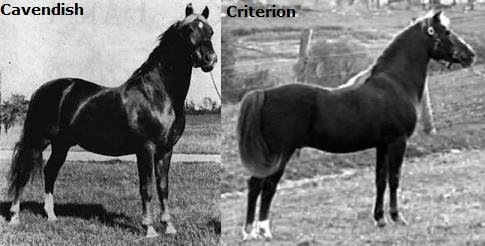 Criterion was the founding stallion of the Quietude herd, which their stock, along with other Lambert breeders, is closely bred to. There, Criterion stamped his good looks and great temperament onto his children and grandchildren much like Figure had done with his get. Cavendish was the founder of the Caven-Glo Lamberts, but it seems that very few of these Lamberts have truly continued the pure Lambert line. And as for choosing the mares, many of the founding mares were of "Lippitt" decent (to explain in a simpler term), but were selected for their bloodlines that were rich in the blood of Figure's three sons. **Now, certain people (myself being one of them) have a hard time attempting to tell the difference between the Lambert Family and Brunk line due to Jubilee King. For some Lambert breeders, they explain it through the blood of Figure's sons, which is usually hard to follow if you don't know your bloodlines. For me to explain to someone that doesn't know, in today's breeding you can tell a Lambert by seeing the Quietude and/or Caven-Glo prefix stamped all over the pedigree with a few mares still retaining the "Lippitt" prefix. If you begin to see the blood of the other families, it usually means bloodlines have been out crossed. The Golden Cross Morgans don't technically come from a single Morgan horse and don't technically have a "family". They are widely called Golden Crosses because they are a blend of branches, a cross of the bloodlines to bring the better of two families in one Morgan horse. The most well known Golden Crosses are the crossing of the Government with the Lippitt lines and the Brunk or 2WF with the Lambert lines. Seldom there are crosses of Government with Brunk, while Lippitt with Brunk and the Government with the Lambert or 2WF are common. 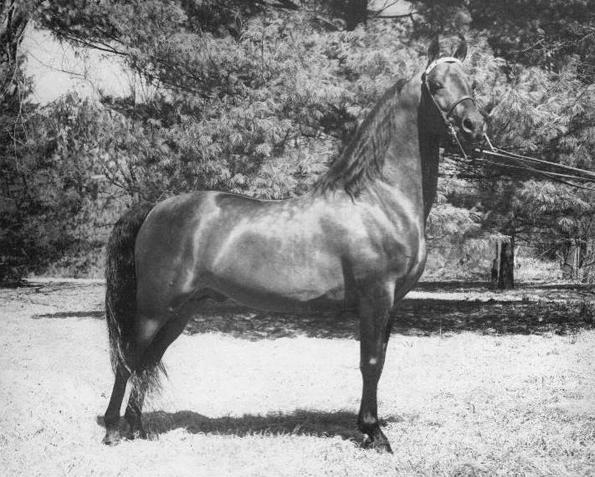 There are many Golden Crosses of all kinds out there, and the one that many Show Morgan enthusiasts will recognize is the famous show stallion, Waseeka's Nocturne. 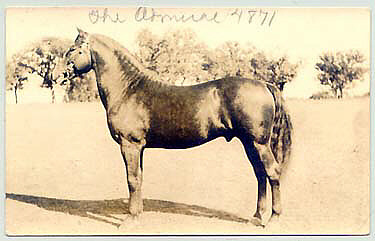 Nocturne's sire, Starfire, belonged to the Western Working family while his dam, Upwey Benn Quietude, was of the Government family. As far as I know, Nocturne is one of the earliest Golden Crosses of the Government and Western Working cross, but this cross is truly "golden" because of not only his conformation, but because of the combining of bloodlines and for his fame throughout the Morgan world as a beautiful sire and renowned show horse.